Initially this article was to be called “More of Quebec.” But there were too many other places, people, and things calling me from all over Canada that it had to be more general. I will however start by reminding the reader that when in Quebec, make sure that you allow yourself the time to go to a great spa. They are easy to find are often in nature and outdoors which makes the experience that much more enjoyable. 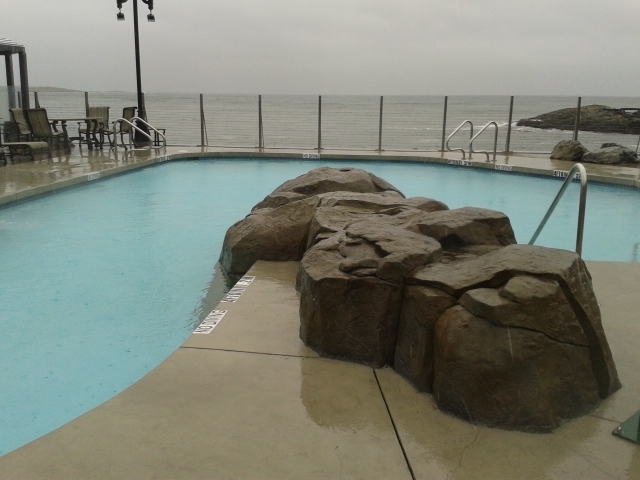 There are always great bathing options (sauna, steam, pools, cold dunks). But first I’ll start with one of my favorites. 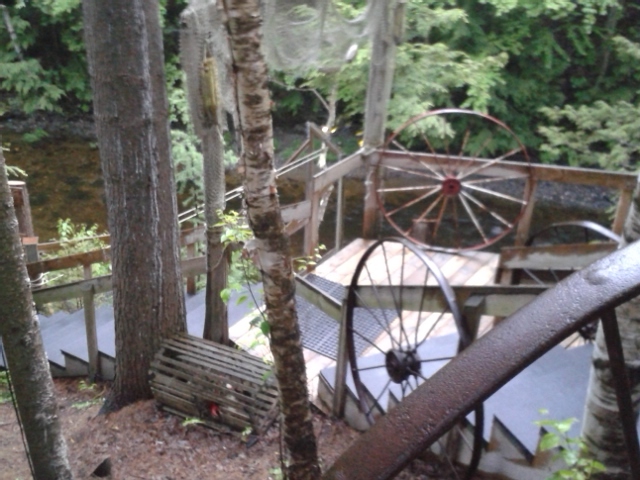 This location should really be in the category of resort, but with a very distinctive Quebec, summer camp kind of feel. That is to say that the focus is on outdoor activities, which includes relaxing in the evening. Jouvence holds a special place in my heart. Good times have been spent there, friendships were forged and memories made. Jouvence does host many groups but there is also the option of going there on your own as well. 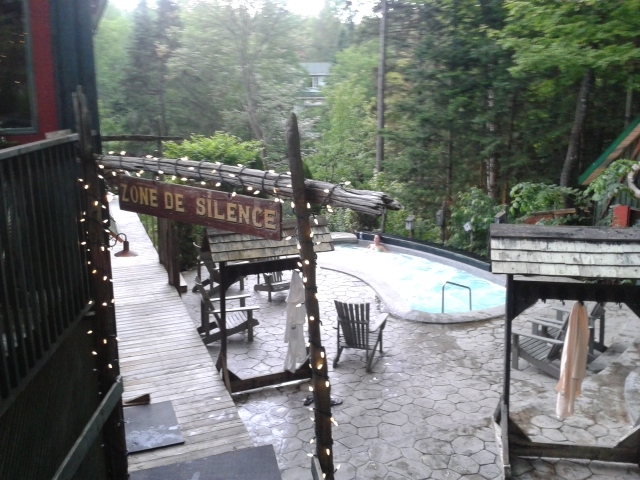 Other than having hiking trails, kayaking, swimming, great rustic cabins, good food, and comfy campfires, Jouvence has a great little outdoor spot for bathing. 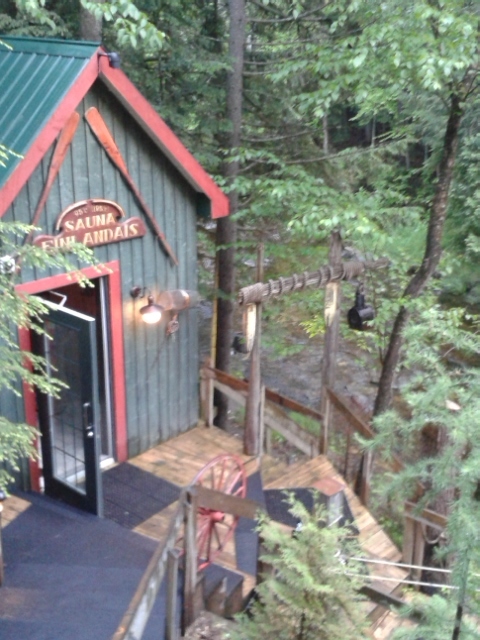 This includes a hot tub, a sauna and access to a creek to cold dunk in. Hanging out in your swimsuit, under the stars, and watching the lightning bugs is a wonderful nighttime activity. Be careful going down to the creek – it’s always slippery! Something else to look into is a more isolated cabin that they have for smaller groups, that has a very modern looking sweat lodge! Whatever you decide, if you are outdoorsy and you love a great sweat, be sure to make the 2-hour trip from Montreal to Jouvence. Thanks Jouvence for the wonderful years. Six weeks in 7 years doesn’t seem like much but you left an impression on me. But there are soooo many options in that area. Really one could spend at least two weeks checking out all the spas in the area. 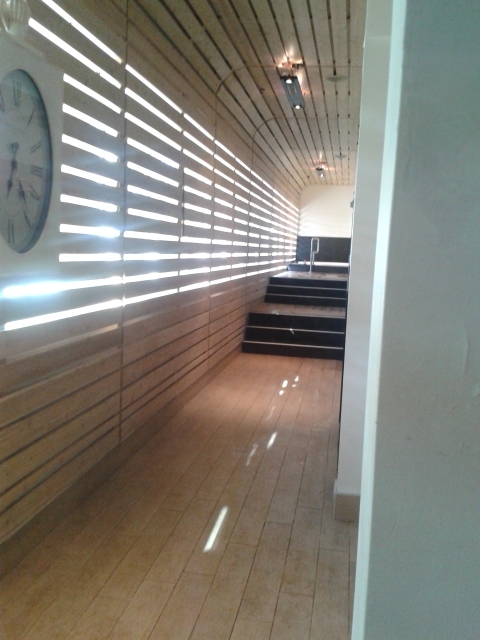 One that is close by to Jouvence is Spa Nordic Station. Situated in the woods, slope side, this bathing spa has something for everyone and is quite successful at creating an almost magical ambience. 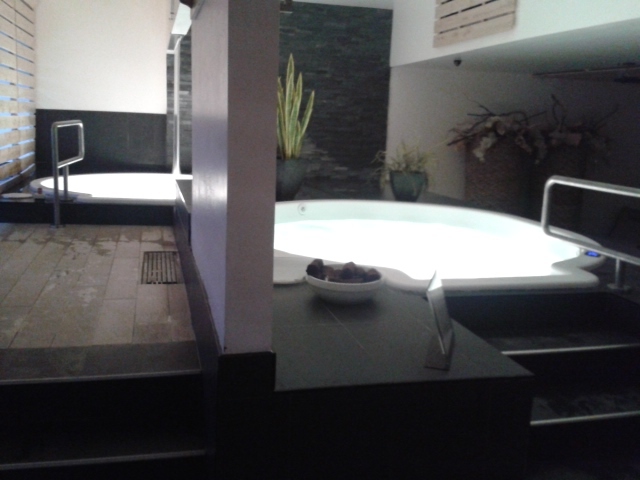 This spa is meant to explore having nooks and crannies to discover around each corner. It is set up with small little shacks everywhere, each with their own purpose. Outdoor pools and waterfalls can be hot or cold. I’m not entirely sure but I think that they might be going for almost an old mine, or perhaps, primitive hot springs feel. It has a distinctly quaint feel but is in fact quite a large facility. I definitely felt like I needed more time there to experience everything there. There were at least 2 hot pools, 2 cold dunks with waterfalls, a eucalyptus steam room, a number of outdoor and indoor rest areas, a finish sauna and (my favorite), a sauna down by the river! 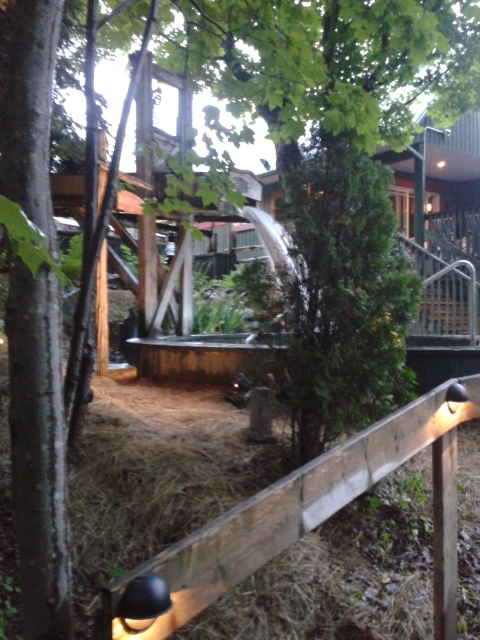 There are a few spas in Quebec that capitalize from Canada’s abundance of natural falling water and Nordic Station is one of them. 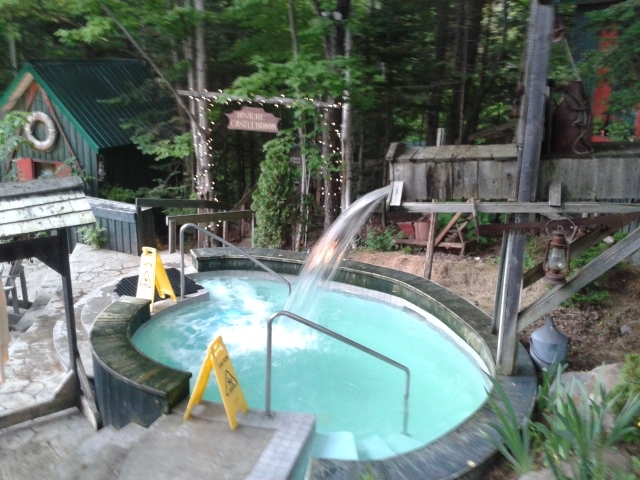 As in some other cases in Quebec, this spa offers the creek as a way to cool down after your sweat. For so many, this is really the only legitimate bathing practice, and so it is really nice to see it done here for those of us who don’t have those private luxuries (i.e. 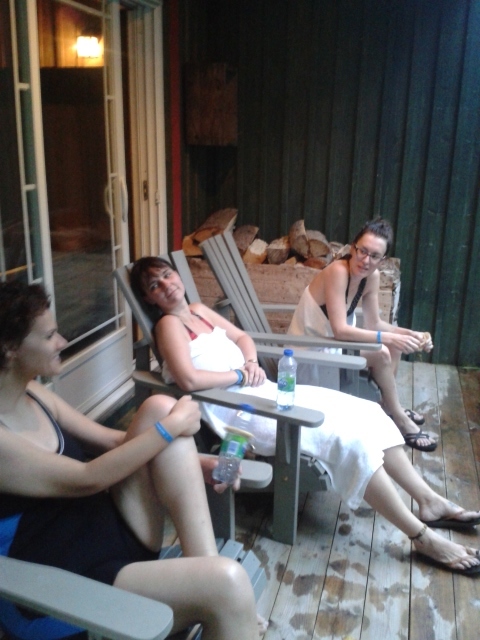 don’t have our own sauna on a lake on private property). Do be careful those on your way down. But enjoy the time. It does go without saying that because of its hillside location and multiple slippery stairs; this is not the spa for your grandma. 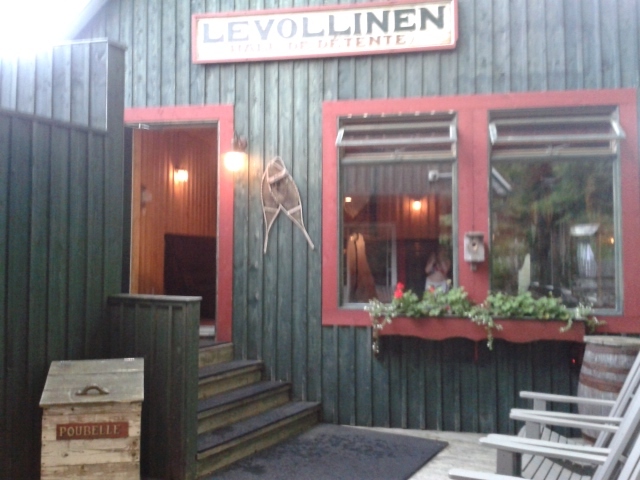 Overall Nordic Station is a lovely place to relax and explore multiple bathing facilities. Just being outdoors, amidst the trees and sitting in a warm pool or dry sauna is lovely, and there are definitely enough places to rest and take it all in. Everyone had a great time. Thanks ladies for indulging me and getting away from work for a few hours. Unfortunately we can’t all spend all of our time out in the bushes of La Belle Province. Fortunately, Montreal always provides new bathing experiences to take in as well– such as Scale Santé. 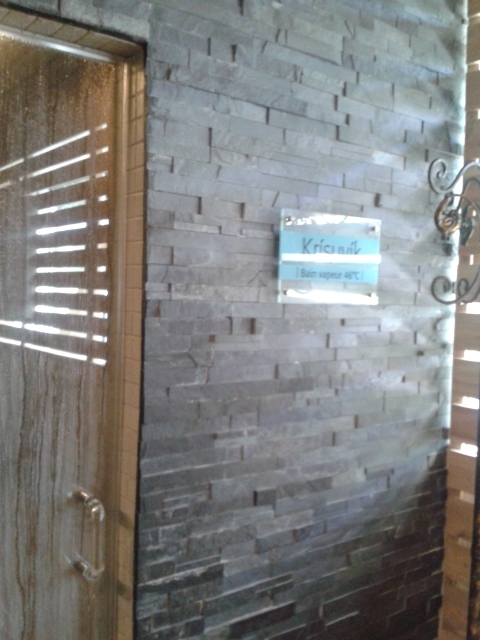 For those who have been following thelostfaucet.com, you will know that this will be at least the third Montreal specific spa that I have reviewed, and there are still a bunch that could be explore right inside the Montreal city limits. Urban spas must always reflect the cosmopolitan surroundings of the city while at the same time offer a sanctuary from that city buzz. In the case of Scale Santé, one would never even imagine that there would be a bathing spa inside of the somewhat blasé professional building that houses Scale Santé Spa. But once you change into your bathing suit, hang out in the living room-feeling rest area, and get into the warmth, you are you are happy that you followed through. I thought that the design of this urban spa was quite clever. It felt clean and modern, sleek and bright, which is definitely something that can be difficult to achieve in a city. If you are going to relax, I feel like it can be difficult to do if you are constantly reminded that you are in a city. And yet the modern feel to Scale Santé allows for a more serene and private urban space. It’s actually a really weird sensation that one has going from the darker living room rest area (with a large flat screen TV playing nature documentaries) to the bright and open area of the bathing features, almost as if you have a spa in your own home. But light seems to get in everywhere here, which contrasts the cold slate and stone features that make up the cold showers, steam room, whirl pools, cold dunk with cold waterfall (if I recall correctly), and dry sauna. 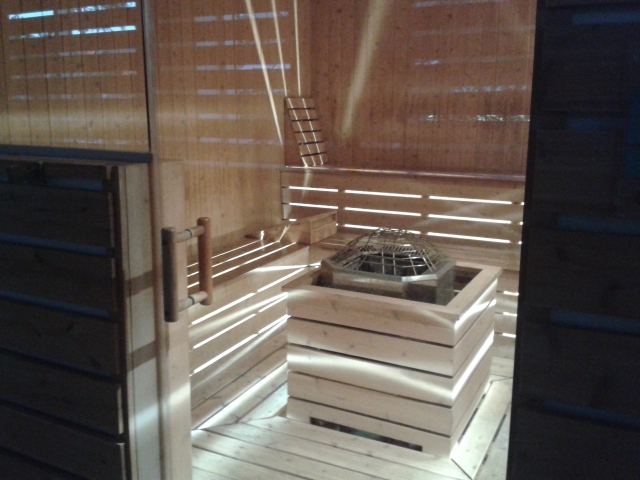 In fact, even the sauna seems to be glowing. Unfortunately, the features themselves could have been a bit more intense. 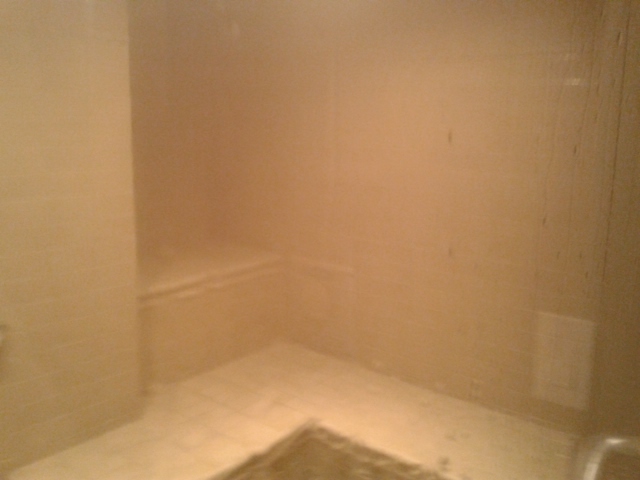 That is to say that the sauna really didn’t get very hot and the pools where nice but a little small. I did like that the pools were raised. 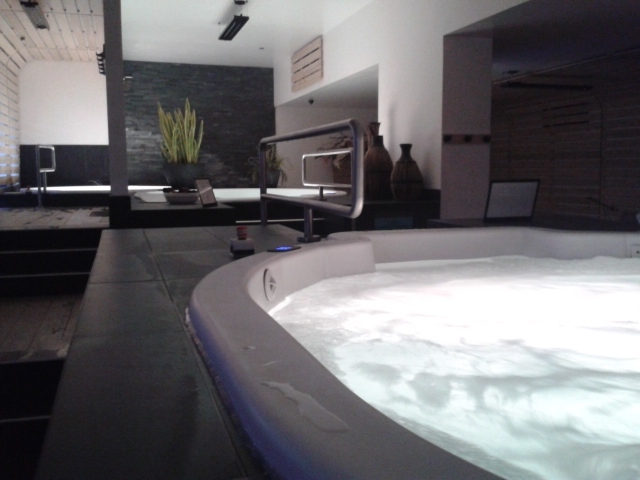 It was probably a design necessity, what with the spa being in a business building, but I quite enjoyed it. Overall Scale Santé was good – a good retreat from the city – but for the dedicated bather, hotter warming features would be preferable. Now to jump back allllll the way to the west coast, we go to Victoria. 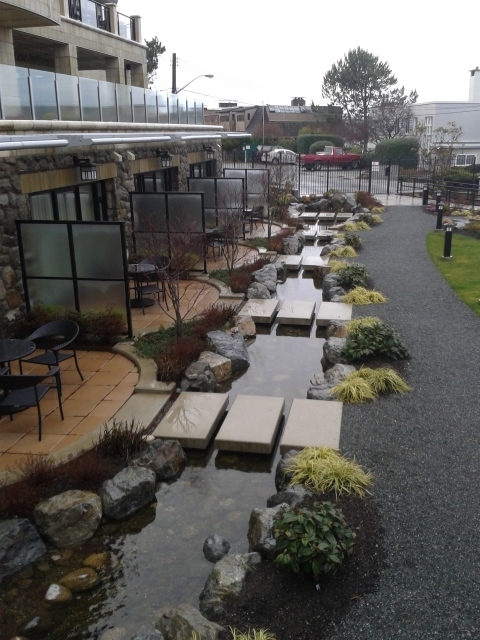 There are a few little gems to discover in Victoria in terms of bathing spas, but I think that I likely found the best one right off the bat! There was no holding back with this spa. 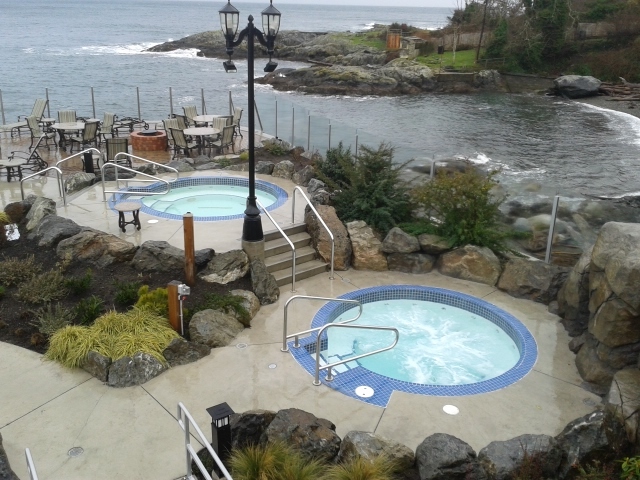 For so many reasons I think that Oak Bay Beach Hotel Spa might be the closest example of what the great Canadian Spa could look like. Of course, that is if the great Canadian Spa were on the ocean. Certainly next to water would have to come into play in creating a perfect Canadian spa. 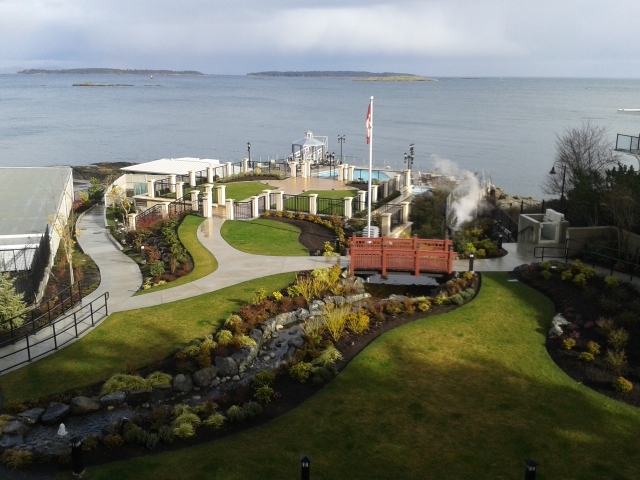 But the spa at Oak Bay Beach Hotel was lovely. I really loved how the design took into account the need for the view of the ocean, complete with windswept grasses, and lapping waves in the not too far distance. 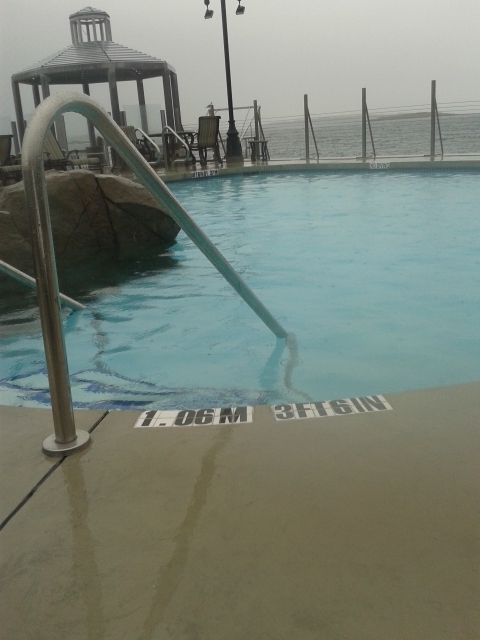 Unfortunately the days that we stayed at the hotel and took advantage of the pools, the weather did not cooperate. 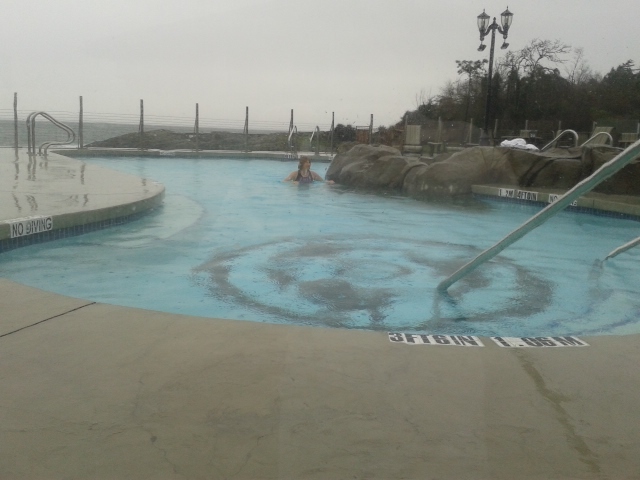 But even then, there was something comforting about the maritime weather whipping around our ears while our bodies sat in the warm and soothing mineral baths. As you see in the picture above it was definitely a sprint to the water kind of day! But I say that this has the potential to be the best incarnation of what a Canadian spa should look like, but there definitely were a few things missing. Firstly it was super frustrating to not be able to have anywhere, under a canopy to put our towels. This is a major oversight, so easily fixed, and though we tried to hide our towels from the rain, we nonetheless had to cover our warm bodies with our cold and now soaked towels. The water in the mineral pool was just warm, not hot by any means, but warm. Sometimes not really even warm enough to stay in for long. 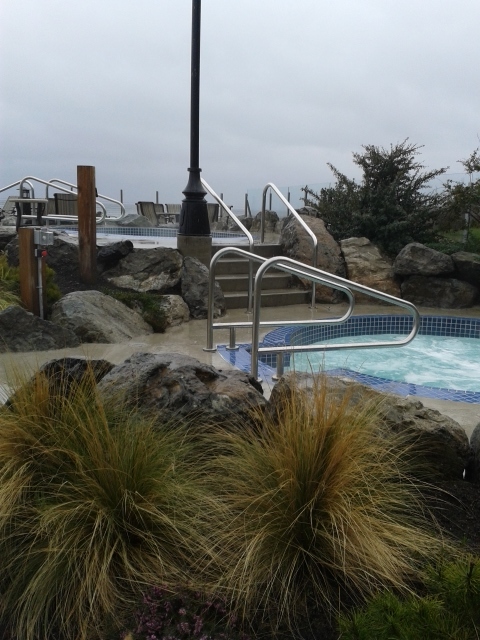 A couple of times I had to move to the hot tubs to actually warm up. I know that minerals can only sustain a certain temperature before they break down and are no longer therapeutic, but I feel as though the pool outside was loosing a lot of heat. Which brings me to my next point – safety. The pool is open 24/7, which means that any one could come in at any time, without anyone knowing. I’m sure they have cameras, but honestly, going alone at midnight, though is probably safe, as a single woman, I probably wouldn’t bother. Which brings me to an amazing point which is: THE POOLS ARE OPEN 24 HOURS!!!! It was so great to go down from 11pm-12pm with my partner in the dark and soak under the stars by the ocean. 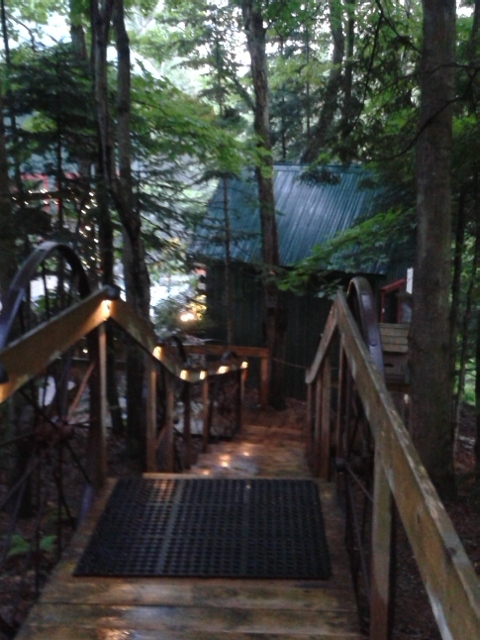 It was really quite magical and cozy! It had stopped raining, we saw a few stars and we had the whole place to ourselves. 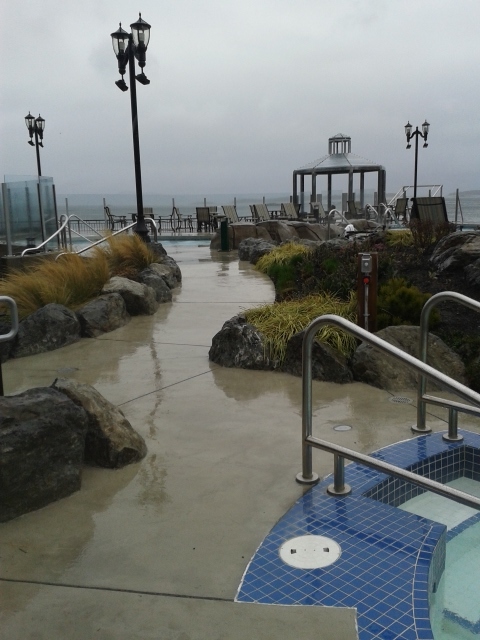 We could sit in the beach house, in the steam room alone, then run out to the mineral pool, float for a while, and warm up in the whirl pool before warming up in the steam room again for the walk up to our 5 star hotel suite! It was great having everything all in one place and to be able to have access all night long. The argument then followed: not only is the place romantic for couples but it would also be awesome to have all your friends there for an all night swim party, therefore it would be a great place for a wedding or anniversary!!! Seriously it would be so much fun! Hopefully the weather will be better when you go, because there are great places for photos and I believe they have ceremonies out on the lawn quite often. One last little note: it is a 5 star hotel with 5 star prices. Make sure you look for a deal. But you can also get a day pass for the pools. I actually met a local there, so you can still enjoy the pools without the outrageous prices. 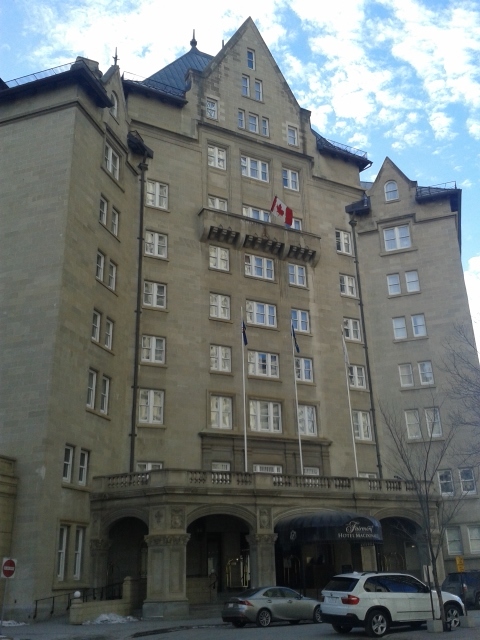 For many years the Hotel MacDonald have been known in Edmonton as a prestigious and expensive hotel option, it being Edmonton’s CN hotel. I had been to the hotel for events before but I had never taken advantage of the pool. It’s always a little funny finding spas in these old CN hotels; they seem to pop out of narrow carpeted hallways and feels as if it was redesigned in the 80s. For the most part this spa was alright, though I don’t think you would have to make the trip specifically. 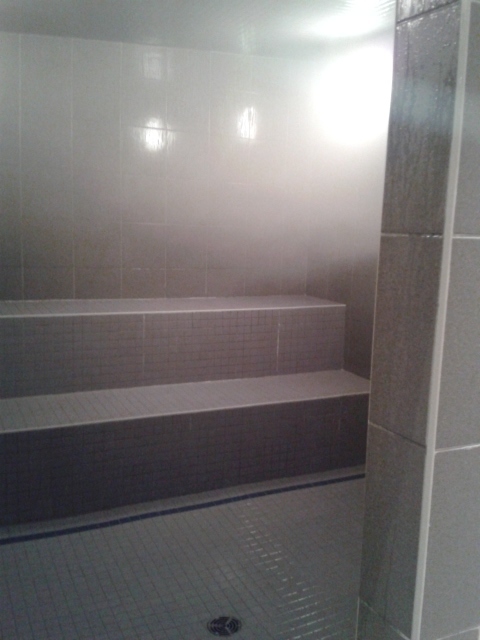 The steam room was good and had a spray bottle of eucalyptus. The sauna on the other hand, was falling apart, it eventually got warm enough to sweat, but as is common in hotel spas, it just doesn’t really get significantly hot. 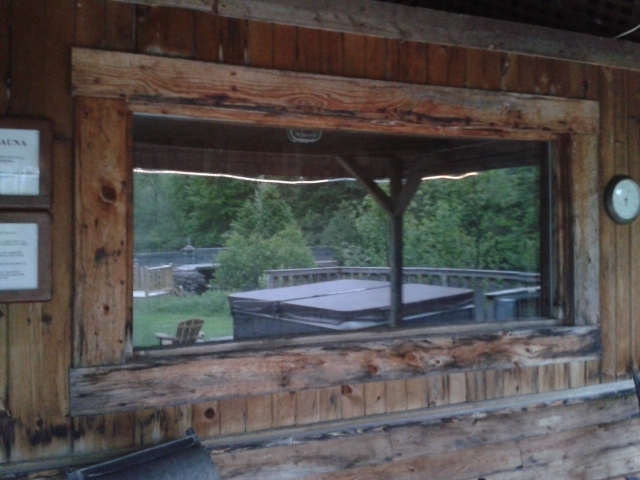 The sauna is desperately in need of an overhaul – too embarrassed to show the photo here. The pool was a perfect temperature after a sweat. 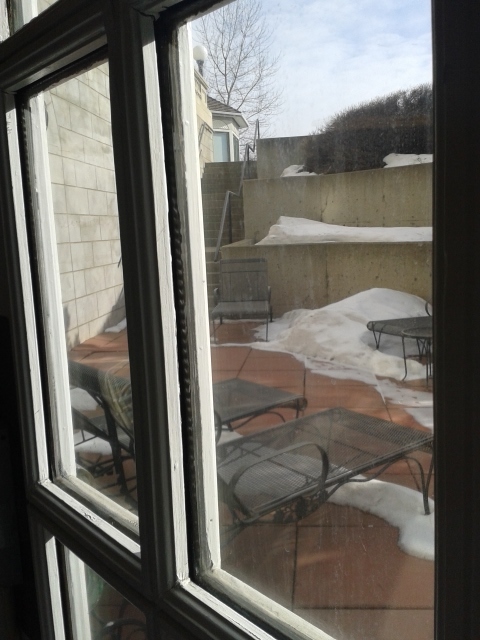 And there was an outdoor patio to enjoy the sun – perhaps on a day that is not in the middle of winter, like when I went. 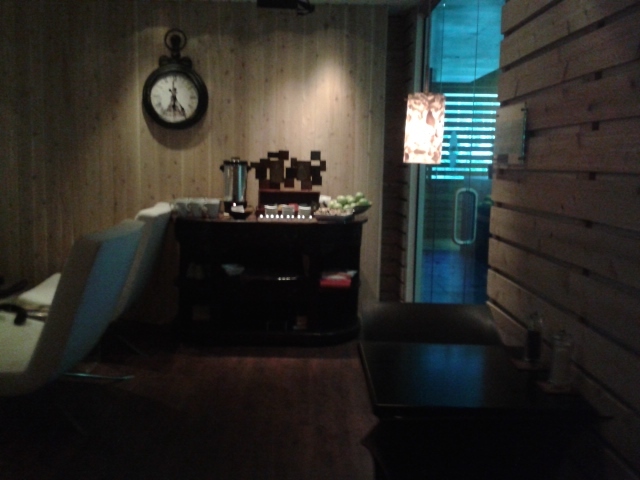 But I think that the main draw to this downtown spa would be its peacefulness. There were not too many people there, the entrance was just over $20 and it was very easily accessible by the LRT. If I lived in Edmonton I would consider getting a membership simply because in Edmonton there are very limited bathing options, so at least the Hotel MacDonald offers one that had the basics and it wasn’t a public swimming pool. Though I’ve been doing this for a few years now there still seems to be some great places to explore all over Canada, with varying results – all the more reason to keep reading and make sure that you are giving yourself the very best when you bathe in Canada. Until next time!